As the S&P500 hit an intraday all-time high yesterday, it’s been nearly 9 months since I posted on the valuation of the S&P500 (here). Since then, I have touched on factors like the reversal of global QE flows by Central Banks (here) and the lax credit terms that may be exposed by tightening monetary conditions (here). Although the traditional pull back after labor day in the US hasn’t been a big feature in recent years, the market feels frothy and a pullback seems plausible. The TINA (There Is No Alternative) trade is looking distinctly tired as the bull market approaches the 3,500-day mark. So now is an opportune time to review some of the arguments on valuations. Fortune magazine recently had an interesting summary piece on the mounting headwinds in the US which indicate that “the current economic expansion is much nearer its end than its beginning”. Higher interest rates and the uncertainty from the ongoing Trump trade squabble are obvious headwinds that have caused nervous investors to moderate slightly valuation multiples from late last year. The Fortune article points to factors like low unemployment rates and restrictions on immigration pushing up wage costs, rising oil prices, the fleeting nature of Trump’s tax cuts against the long-term impact on federal debt, high corporate debt levels (with debt to EBITDA levels at 15 years high) and the over-optimistic earnings growth estimated by analysts. That last point may seem harsh given the 24% and 10% growth in reported quarterly EPS and revenue respectively in Q2 2018 over Q2 2017, according to Factset as at 10/08/2018. The graph below shows the quarterly reported growth projections by analysts, as per S&P Dow Jones Indices, with a fall off in quarterly growth in 2019 from the mid-20’s down to a 10-15% range, as items like the tax cuts wash out. Clearly 10-15% earnings growth in 2019 is still assuming strong earnings and has some commentators questioning whether analysts are being too optimistic given the potential headwinds outlined above. According to Factset as at 10/08/2018, the 12-month forward PE of 16.6 is around the 5-year average level and 15% above the 10-year average, as below. As at the S&P500 high on 21/08/2018, the 12-month forward PE is 16.8. In terms of the Shiller PE or the cyclically adjusted PE (PE10), the graph below shows that the current PE10 ratio of 32.65 as at the S&P500 high on 21/08/2018, which is 63% higher than 50-year average of 20. For the purists, the current PE10 is 89% above the 100-year average. 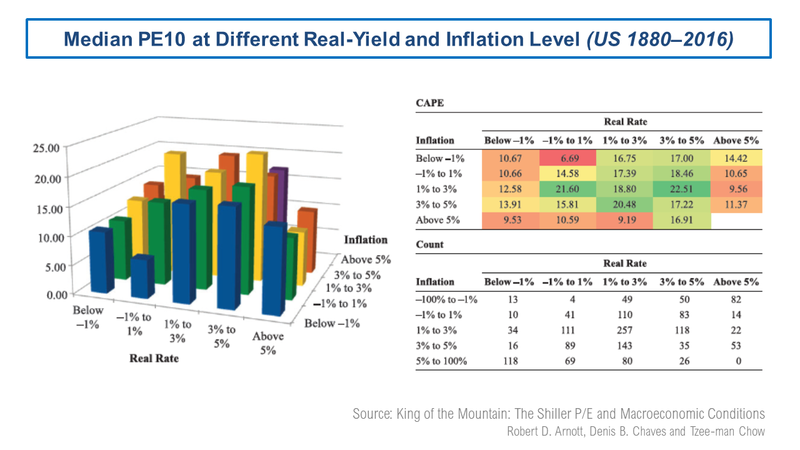 According to this very interesting research paper called King of the Mountain, the PE10 metric varies across different macro-economic conditions, specifically the level of real interest rates and inflation. The authors further claim that PE10 becomes a statistically significant and economically meaningful predictor of shorter-term returns under the assumption that PE10 levels mean-revert toward the levels suggested by prevailing macroeconomic conditions rather than toward long-term averages. The graph below shows the results from the research for different real yield and inflation levels, the so-called valuation mountain. At a real yield around 1% and inflation around 2%, the research suggests a median PE around 20 is reasonable. Although I know that median is not the same as mean, the 20 figure is consistent with the 50-year PE10 average. 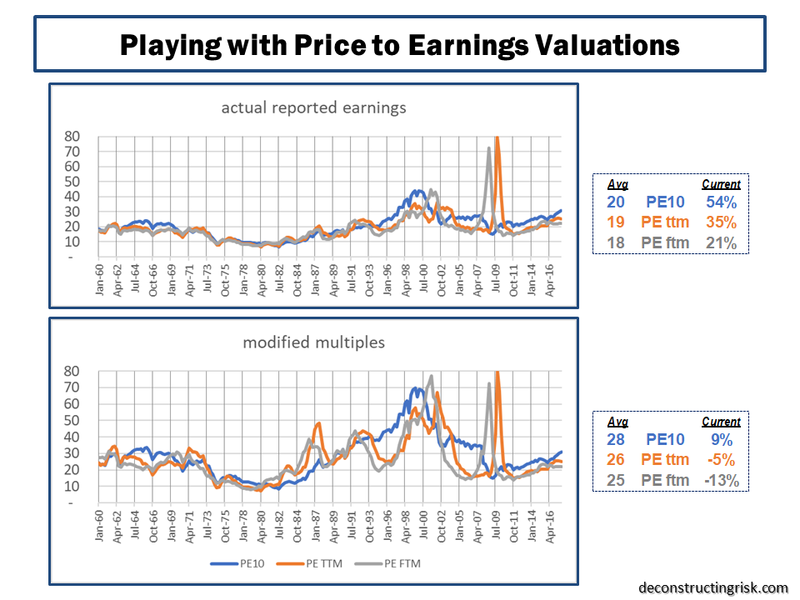 The debates on CAPE/PE10 as a valuation metric have been extensively aired in this blog (here and here are examples) and range around the use of historically applicable earnings data, adjustments around changes in accounting methodology (such as FAS 142/144 on intangible write downs), relevant time periods to reflect structural changes in the economy, changes in dividend pay-out ratios, the increased contribution of foreign earnings in US firms, and the reduced contribution of labour costs (due to low real wage inflation). One hotly debated issue around CAPE/PE10 is the impact of the changing profit margin levels. 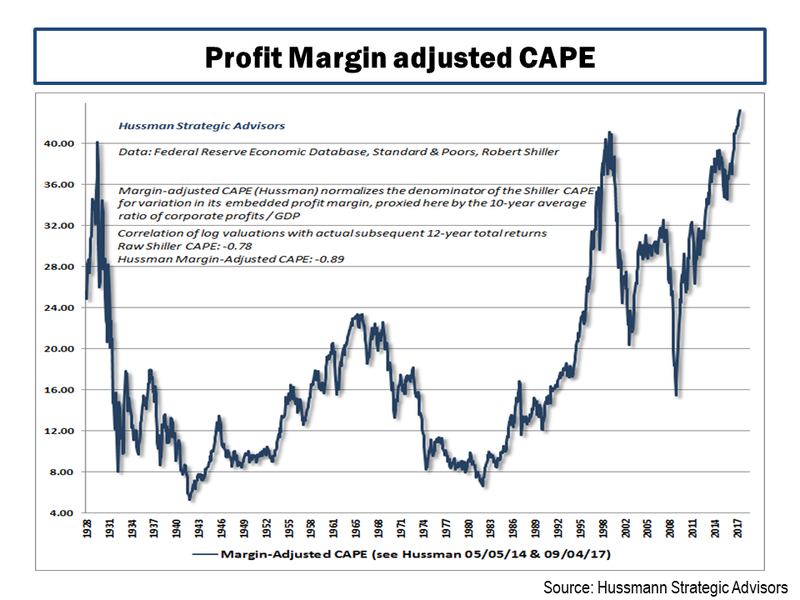 One conservative adjustment to PE10 for changes in profit margins is the John Hussman adjusted CAPE/PE10, as below, which attempts to normalise profit margins in the metric. This metric indicates that the current market is at an all time high, above the 1920s and internet bubbles (it sure doesn’t feel like that!!). In Hussman’s most recent market commentary, he states that “we project market losses over the completion of this cycle on the order of -64% for the S&P 500 Index”. Given the technological changes in business models and structures across economic systems, I believe that assuming current profit margins “normalise” to the average is too conservative, particularly given the potential for AI and digital transformation to cut costs across a range of business models over the medium term. Based upon my crude adjustment to the PE10 for 2010 and prior, as outlined in the previous Broken Record post (i.e. adjusted to 8.5%), using US corporate profits as a % of US GDP as a proxy for profit margins, the current PE10 of 32.65 is 21% above my profit margin adjusted 50-year average of 27, as shown below. So, in summary, the different ranges of overvaluation for the S&P500 at its current high are from 15% to 60%. 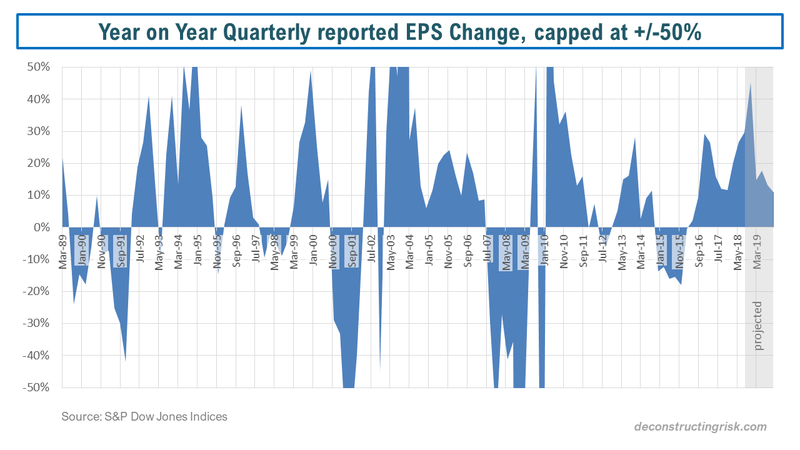 If the 2019 estimates of 10-15% quarterly EPS growth start to look optimistic, whether through deepening trade tensions or tighter monetary policy, I could see a 10% to 15% pullback. If economic headwinds, as above, start to get serious and the prospect of a recession gets real (although these things normally come quickly as a surprise), then something more serious could be possible. On the flipside, I struggle to see where significant upside can come from in terms of getting earnings growth in 2019 past the 10-15% range. A breakthrough in trade tensions may be possible although unlikely before the mid-term elections. All in all, the best it looks like to me in the short term is the S&P500 going sideways from here, absent a post-labor day spurt of profit taking. But hey, my record on calling the end to this bull market has been consistently broken…. Whilst the equity market marches on regardless, hitting highs again today, writing about the never-ending debates over equity valuations makes one feel like a broken record at times. At its current value, I estimate the S&P500 has returned an annualised rate of nearly 11%, excluding dividends, since its low in March 2009. As of the end of September 2017, First Trust estimated the total return from the S&P500 at 18% since March 2009, as per the graph below. 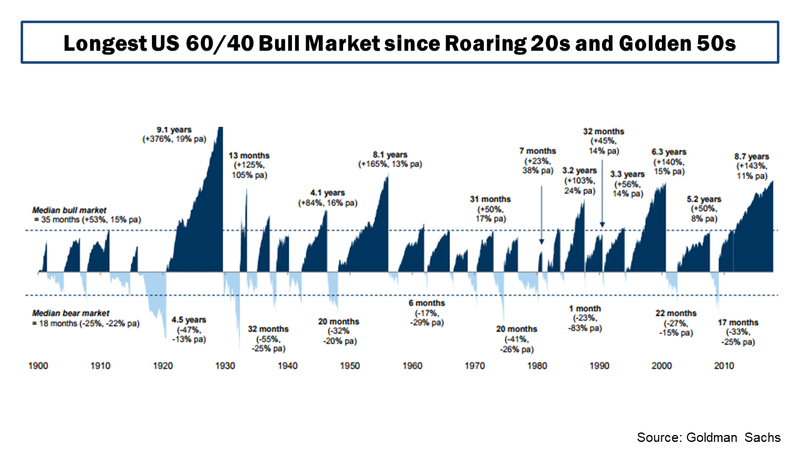 Goldman Sachs recently published an analysis on a portfolio of 60% in the S&P 500 and 40% in 10-year U.S. Treasuries, as per the graph below, and commented that “we are nearing the longest bull market for balanced equity/bond portfolios in over a century, boosted by a Goldilocks backdrop of strong growth without inflation”. They further stated that “it has seldom been the case that all assets are expensive at the same time—historical examples include the Roaring ‘20s and Golden ‘50s. While in the near term, growth might stay strong and valuations could pick up further, they should become a speed limit for returns”. My most recent post on the topic of US equity valuations in May looked at the bull and bear arguments on low interest rates and heighten profit margins by Jeremy Grantham and John Hussman. 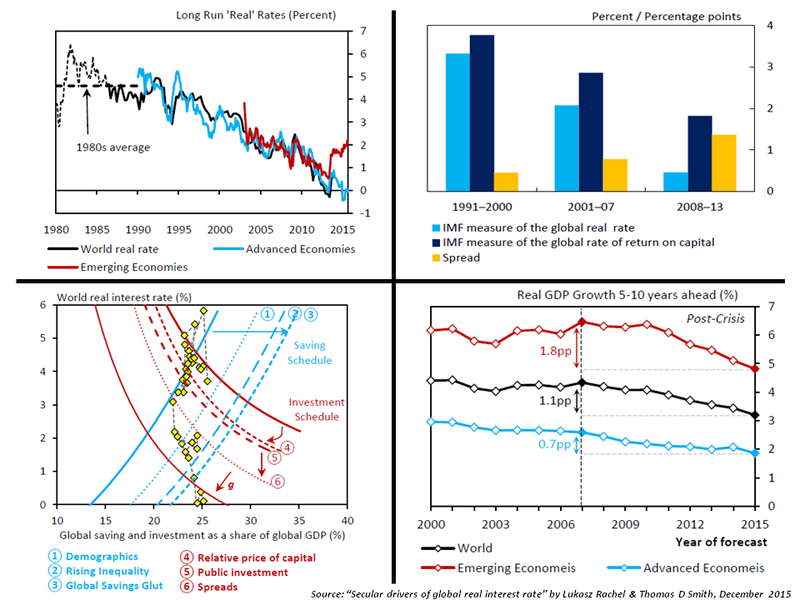 In that post I further highlighted some of the other factors which are part of the valuation debate such as the elevated corporate leverage levels, reduced capital expenditures, and increased financial risk taking as outlined in the April IMF Global Financial Stability report. I also highlighted, in my view, another influential factor related to aging populations, namely the higher level of risk assets in public pensions as the number of retired members increases. 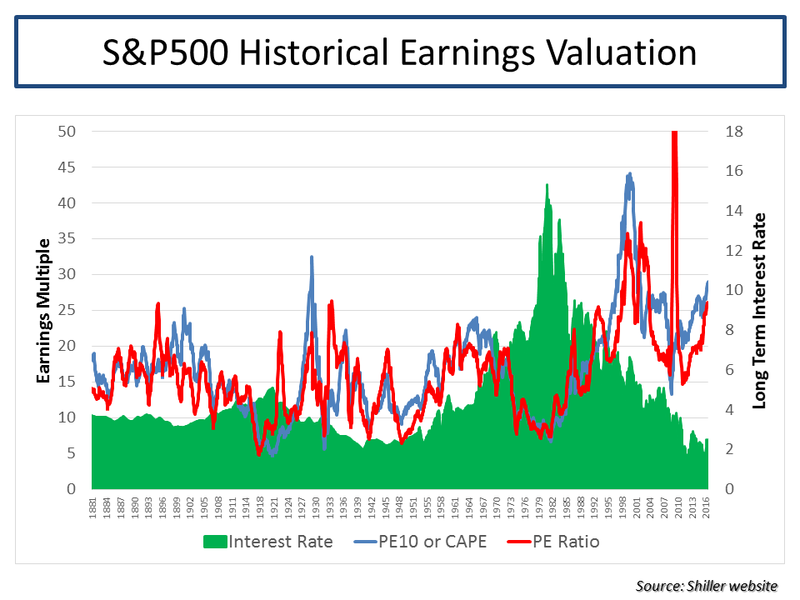 In other posts, such as this one on the cyclically adjusted PE (CAPE or PE10), I have highlighted the debates around the use of historically applicable earnings data in the use of valuation metrics. Adjustments around changes in accounting methodology (such as FAS 142/144 on intangible write downs), relevant time periods to reflect structural changes in the economy, changes in dividend pay-out ratios, the increased contribution of foreign earnings in US firms, and the reduced contribution of labour costs (due to low real wage inflation) are just some examples of items to consider. The FT’s John Authers provided an update in June on the debate between Robert Shiller and Jeremy Siegel over CAPE from a CFA conference earlier this year. Jeremy Siegel articulated his critique of the Shiller CAPE in this piece last year. 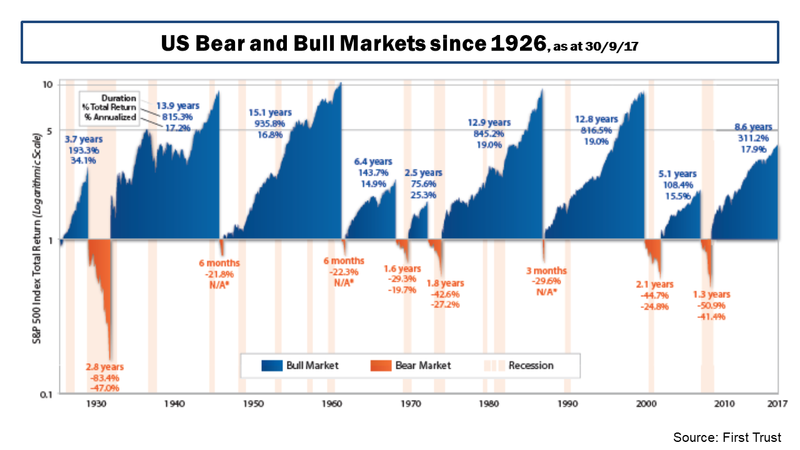 In an article by Robert Shiller in September article, called “The coming bear market?”, he concluded that “the US stock market today looks a lot like it did at the peaks before most of the country’s 13 previous bear markets”. The contribution of technology firms to the bull market, particularly the so-called FANG or FAANG stocks, has also been a much-debated issue of late. 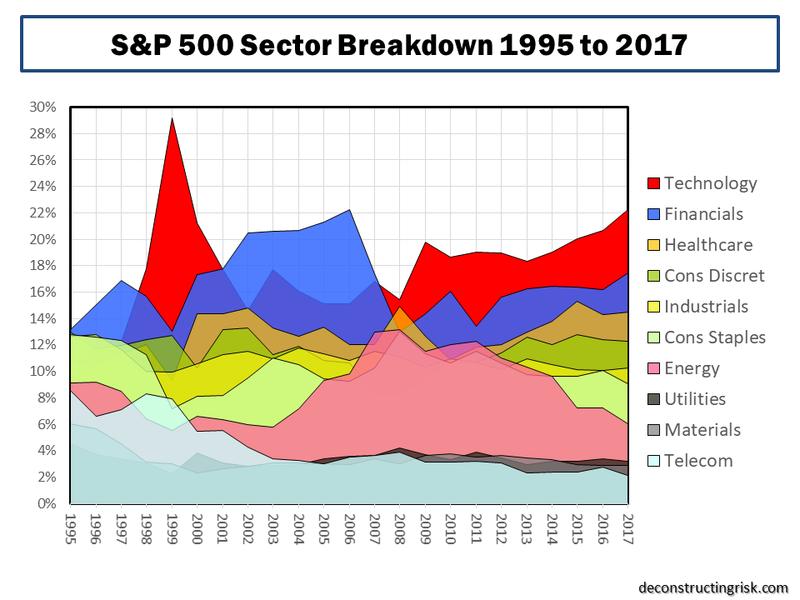 The graph below shows the historical sector breakdown of the S&P500 since 1995. A recent article from GMO called “FAANG SCHMAANG: Don’t Blame the Over-valuation of the S&P Solely on Information Technology” tried to quantify the impact that the shift in sector composition upon valuations and concluded that “today’s higher S&P 500 weight in the relatively expensive Information Technology sector is cause for some of its expensiveness, but it does not explain away the bulk of its high absolute and relative valuation level. No matter how you cut it, the S&P 500 (and most other markets for that matter) is expensive”. 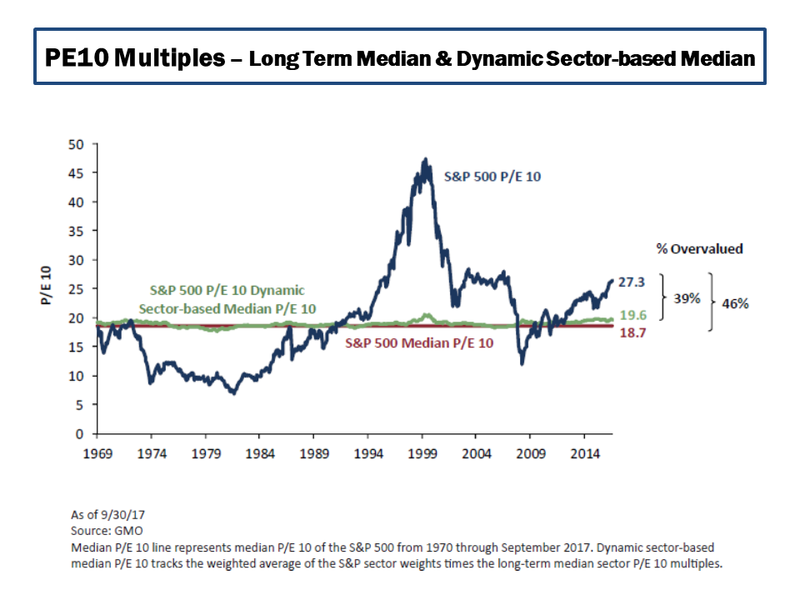 The graph below shows that they estimate the over-valuation of the S&P500, as at the end of September 2017, using their PE10 measure is only reduced from 46% to 39% if re-balanced to take account of today’s sector weightings. In his recent article this month, John Hussman (who meekly referred to “his incorrectly tagged reputation as a permabear”!!) stated that “there’s no need to take a hard-negative outlook here, but don’t allow impatience, fear of missing out, or the illusion of permanently rising stock prices to entice you into entrusting your financial future to the single most overvalued market extreme in history”. As discussed in my May post, Hussman reiterated his counter-argument to Jeremy Grantham’s argument that structurally low interest rates, in the recent past and in the medium term, can justify a “this time it’s different” case. 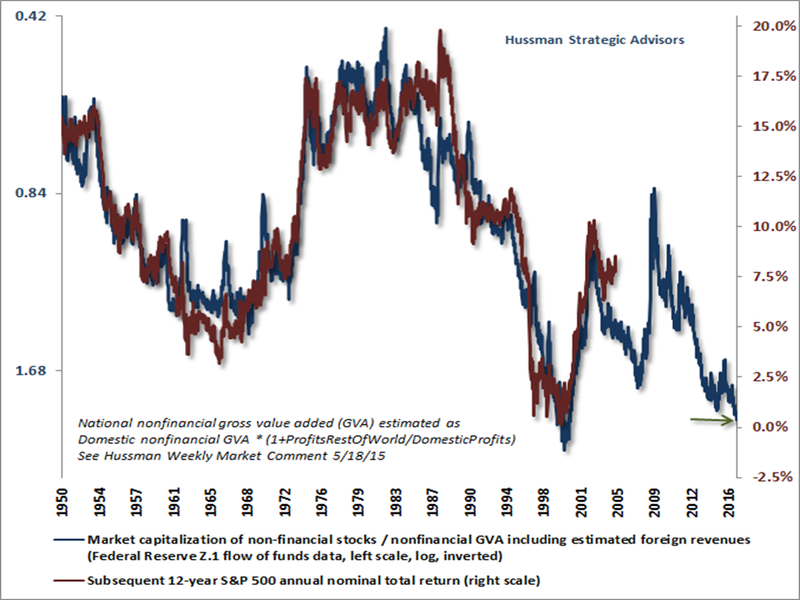 Hussman again states that “the extreme level of valuations cannot, in fact, be “justified” on the basis of depressed interest rates” and that “lower interest rates only justify higher valuations if the stream of future cash flows is held constant” and that “one of the reasons why reliable valuation measures have retained such a high correlation with subsequent market returns across history, regardless of the level of interest rates, is that the impact of interest rates and growth rates on “terminal” valuations systematically offset each other”. Hussman also again counters the argument that higher profit margins are the new normal, stating that “it’s important to recognize just how dependent elevated profit margins are on maintaining permanently depressed wages and salaries, as a share of GDP” and that “simply put, elevated corporate profit margins are the precise mirror-image of depressed labour compensation” which he contends is unlikely to last in a low unemployment environment. 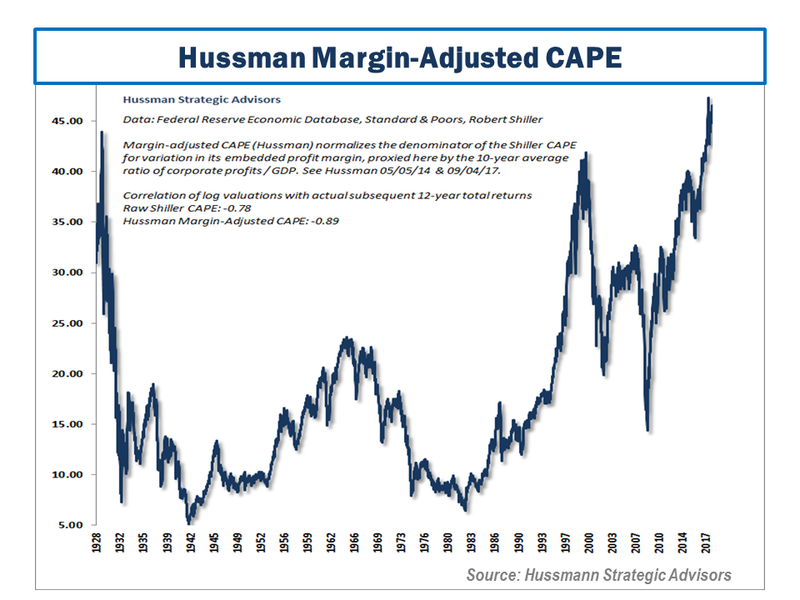 Hussman presents a profit margin adjusted CAPE as of the 3rd of November, reproduced below, which he contends shows that “market valuations are now more extreme than at any point in history, including the 1929 and 2000 market highs”. However, I think that his profit margin analysis is harsh. If you adjust historical earnings upwards for newer higher margin levels, of course the historical earning multiples will be lower. I got to thinking about what current valuations would look like against the past if higher historical profit margins, and therefore earnings, had resulted in higher multiples. 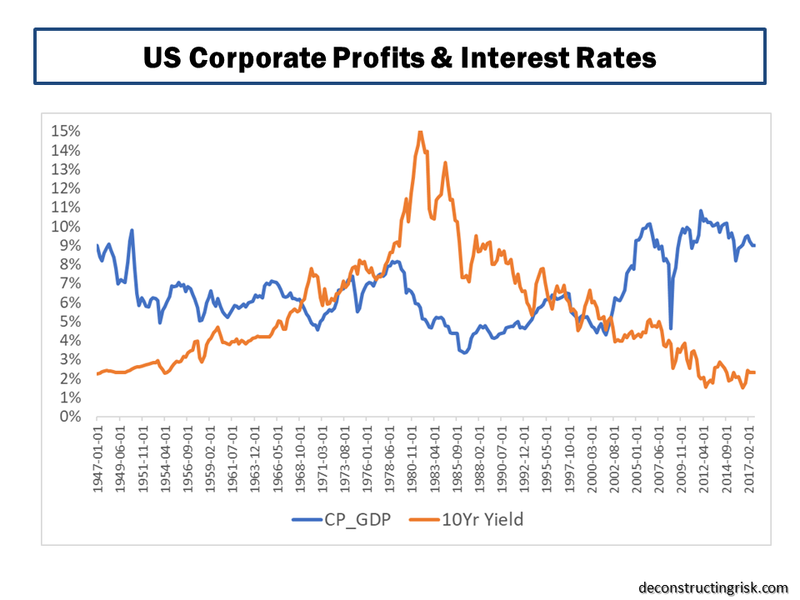 Using data from Shiller’s website, the graph below does present a striking representation of the relationship between corporate profits (accepting the weaknesses in using profits as a percentage of US GDP) and interest rates. Purely as a thought experiment, I played with Shiller’s data, updating the reported earnings for estimates through 2018 (with a small discount to reflect over-zealous estimates as per recent trends of earnings revisions), recent consensus end 2018 S&P500 targets, and consensus inflation and the 10-year US interest rates through 2018. Basically, I tried to represent the base case from current commentators of slowly increasing inflation and interest rates over the short term, with 2018 reported EPS growth of 8% and the S&P500 growing to 2,900 by year end 2018. I then calculated the valuation metrics PE10, the regular PE (using trailing twelve month reported earnings called PE ttm), and the future PE (using forward twelve month reported earnings called PE ftm) to the end of 2018. I further adjusted the earnings multiples, for 2007 and prior, by applying an (principally upward) adjustment equal to a ratio of the pre-2007 actual corporate profits percentage to GDP divided by a newly assumed normalised percentage of 8.5% (lower than the past 10-year average around 9% to factor in some upward wage pressures over the medium term). The resulting historical multiples and averages are shown below. Based upon this analysis, whilst accepting its deeply flawed assumptions, if 2018 follows the base case currently expected (i.e. no external shocks, no big inflation or interest rates moves, steady if not spectacular earnings growth), the S&P500 currently looks over-valued by 50% to 20% using historical norms. If this time it is different and higher profit margins and lower interest rates are the new normal, then the S&P500 looks roughly fairly-valued and current targets for 2018 around 2,900 look achievable. Mind you, it’s a huge leap in mind-set to assume that the long-term average PE is justifiably in the mid-20s. 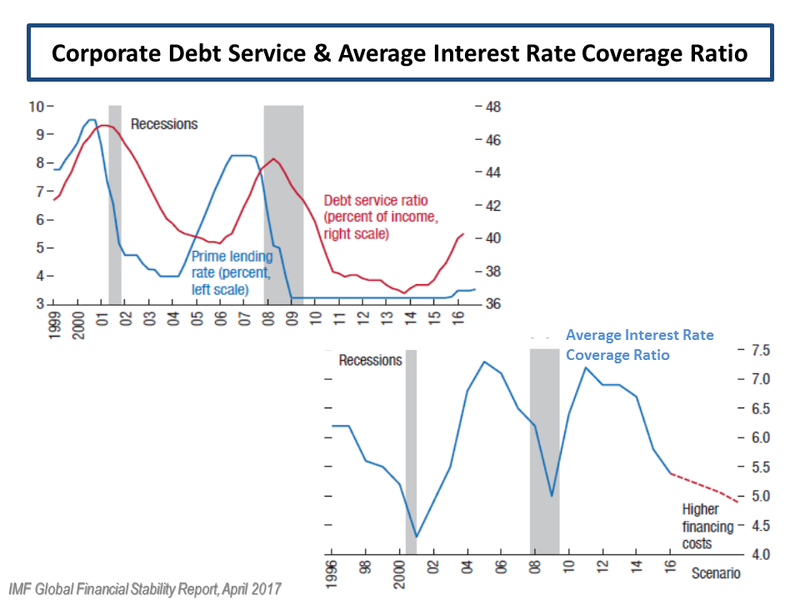 I continue to be concerned about increasing corporate leverage levels, as highlighted in my May post from the IMF Global Financial Stability report in April, and the unforeseen consequences of rising interest rate after such a long period of abnormally low rates. In the interim, to paraphrase an ex-President, it’s all about the earnings stupid! The latest market wobble this week comes under the guise of the endless Trump soap opera and the first widespread use of the impeachment word. I doubt it will be the last time we hear that word! The bookies are now offering even odds of impeachment. My guess is that Trump’s biggest stumble will come over some business conflict of interest and/or a re-emergence of proof of his caveman behaviour towards woman. The prospect of a President Pence is unlikely to deeply upset (the non-crazy) republicans or the market. The issue is likely “when not if” and the impact will depend upon whether the republicans still control Congress. Despite the week’s wobble, the S&P500 is still up over 6% this year. May is always a good month to assess market valuation and revisit the on-going debate on whether historical metrics or forward looking metrics are valid in this low interest rate/elevated profit margin world. Examples of recent posts on this topic include this post one highlighted McKinsey’s work on the changing nature of earnings and this post looked at the impact of technology on profit profiles. 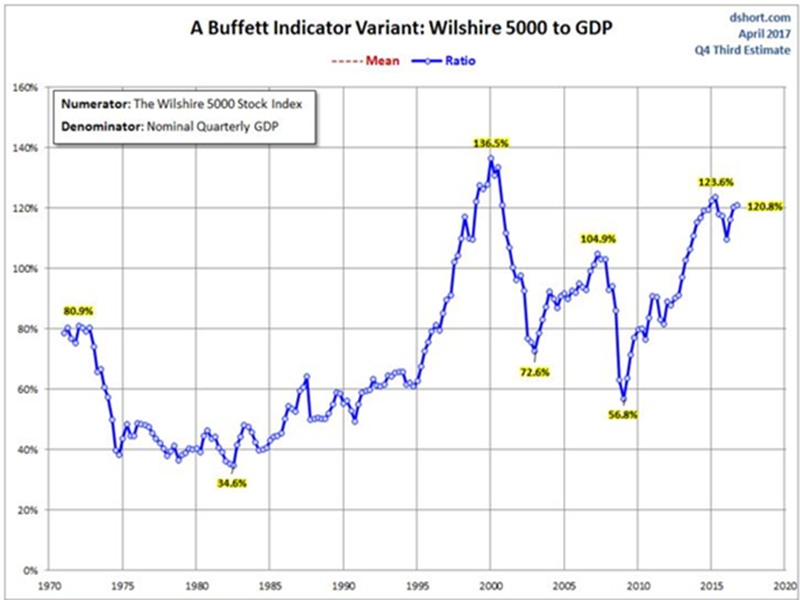 The hedge fund guru Paul Tudor Jones recently stated that a chart of the market’s value relative to US GDP, sometimes called the Buffet indicator as below, should be “terrifying” to central bankers and an indicator that investors are unrealistically valuing future growth in the economy. Other historical indicators such as the S&P500 trailing 12 month PE or the PE10 (aka Shiller CAPE) suggest the market is 60% to 75% overvalued (this old post outlines some of the on-going arguments around CAPE). So, it was fascinating to see a value investor as respected as Jeremy Grantham of GMO recently issue a piece called “This time seems very very different” stating that “the single largest input to higher margins, though, is likely to be the existence of much lower real interest rates since 1997 combined with higher leverage” and that “pre-1997 real rates averaged 200 bps higher than now and leverage was 25% lower”. Graham argues that low interest rates, relative to historical levels, are here for some time to come due to structural reasons including income inequality and aging populations resulting in more aged savers and less younger spenders. Increased monopoly, political, and brand power in modern business models have, according to Graham, reduced the normal competitive pressures and created a new stickiness in profits that has sustained higher margins. The ever-cautious John Hussman is disgusted that such a person as Jeremy Grantham would dare join the “this time it’s different” crowd. In a rebuttal piece, Hussman discounts interest rates as the reason for elevated profits (he points out that debt of U.S. corporations as a ratio to revenues is more than double its historical median) and firmly puts the reason down to declining labour compensation as a share of output prices, as illustrated by the Hussman graph below. 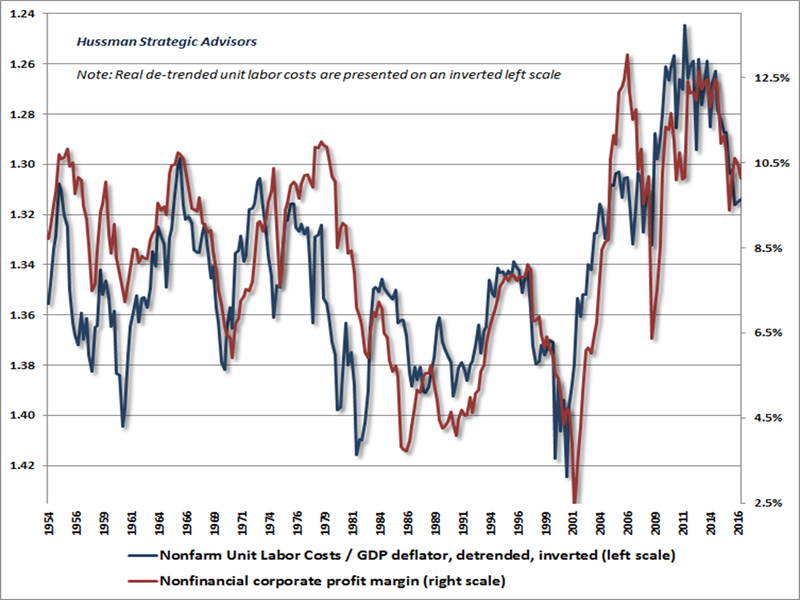 Hussman argues that labour costs and profit margins are in the process of being normalised as the labour market tightens. Bloomberg had an interesting article recently on wage growth and whether the Phillips Curve is still valid. Hussman states that “valuations are now so obscenely elevated that even an outcome that fluctuates modestly about some new, higher average [profit margin] would easily take the S&P 500 35-40% lower over the completion of the current market cycle”. Hussman favoured valuation metric of the ratio of nonfinancial market capitalization to corporate gross value-added (including estimated foreign revenues), shown below, predicts a rocky road ahead. 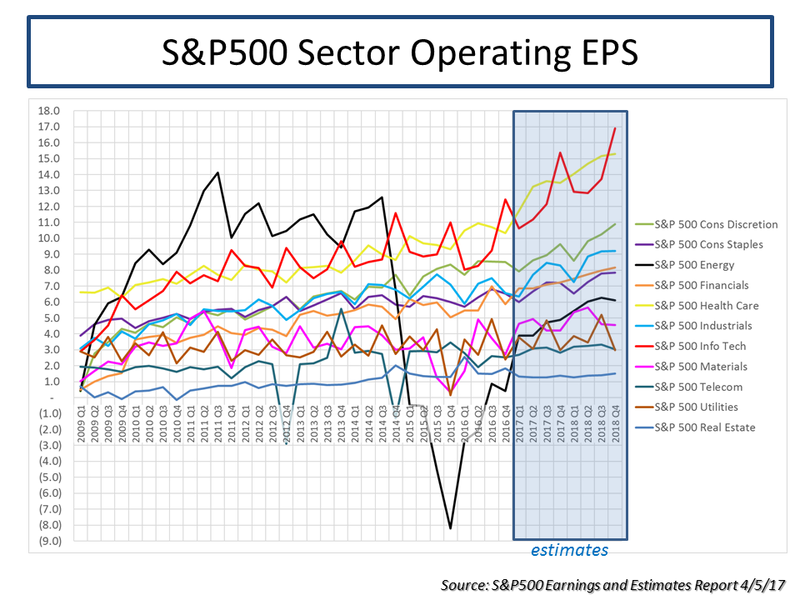 The bulls point to a growing economy and ongoing earnings growth, as illustrated by the S&P figures below on operating EPS projections, particularly in the technology, industrials, energy, healthcare and consumer sectors. Taking operating earnings as a valid valuation metric, the S&P figures show that EPS estimates for 2017 and 2018 (with a small haircut increasing in time to discount the consistent over optimism of analyst forward estimates) support the bull argument that current valuations will be justified by earnings growth over the coming quarters, as shown below. The IMF Global Financial Stability report from April contains some interesting stuff on risks facing the corporate sector. They highlight that financial risk taking (defined as purchases of financial assets, M&A and shareholder pay-outs) has averaged $940 billion a year over the past three years for S&P 500 firms representing more than half of free corporate cash flow, with the health care and information technology sectors being the biggest culprits. The IMF point to elevated leverage levels, as seen in the graph below, reflective of a mature credit cycle which could end badly if interest rates rise above the historical low levels of recent times. 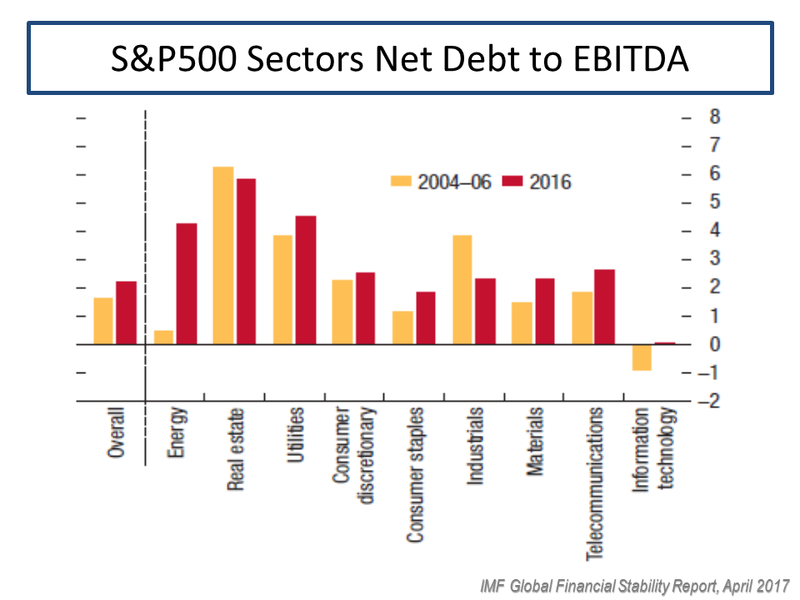 The report highlights that debt levels are uneven with particularly exposed sectors being energy, real estate and utilities, as can be seen below. 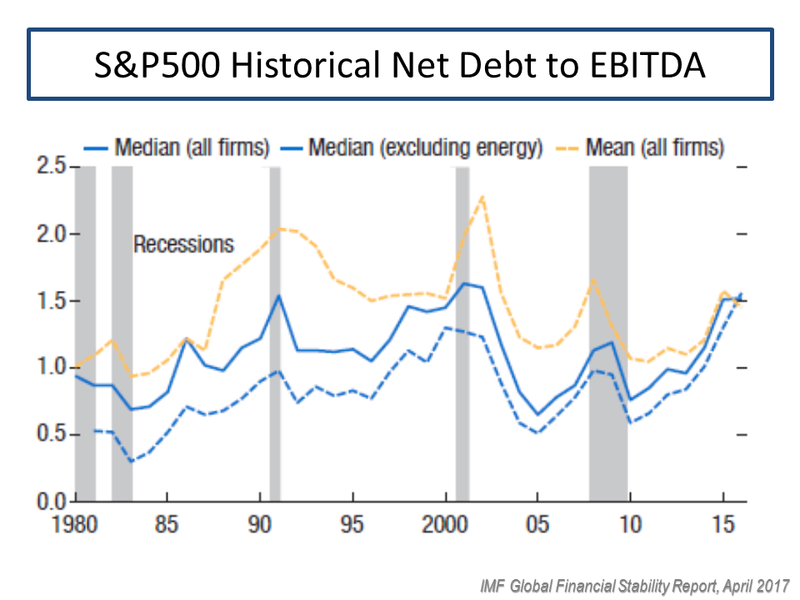 The IMF looked beyond the S&P500 to a broader set of nearly 4,000 US firms to show a similar rise in leverage and capability to service debt, as illustrated below. 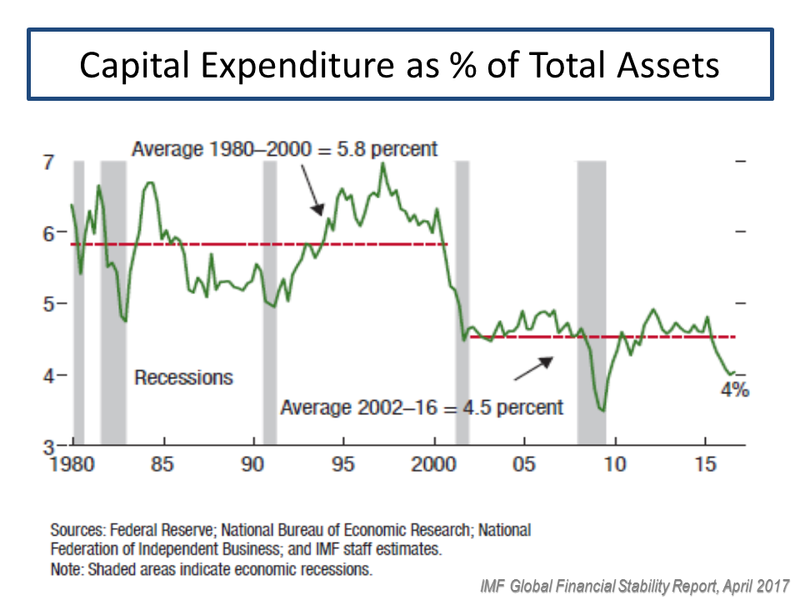 Another graph I found interesting from the IMF report was the one below on the level of historical capital expenditure relative to total assets, as below. A possible explanation is the growth in technology driven business models which don’t require large plant & property investments. The IMF report does point out that tax cuts or offshore tax holidays will, based upon past examples, likely result in more financial risk taking actions rather than increased investment. 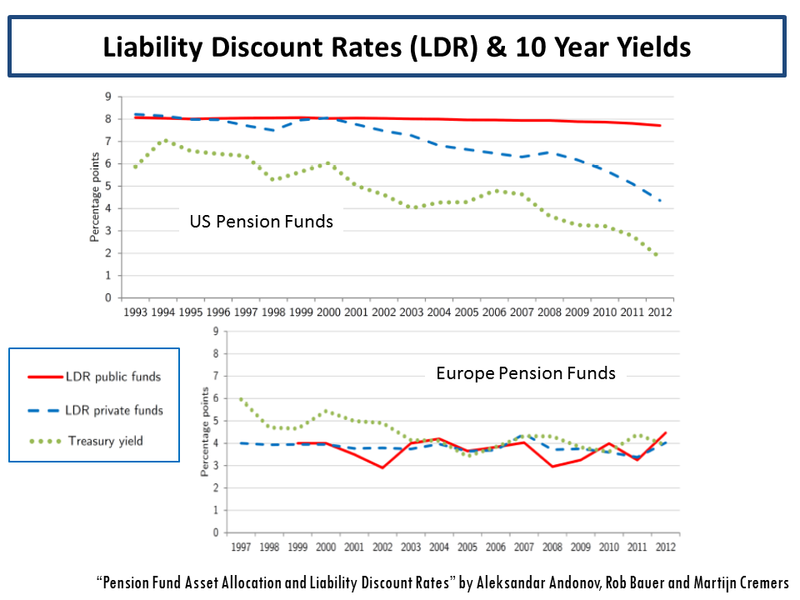 I also found a paper referenced in the report on pensions (“Pension Fund Asset Allocation and Liability Discount Rates” by Aleksandar Andonov, Rob Bauer and Martijn Cremers) interesting as I had suspected that low interest rates have encouraged baby boomers to be over-invested in equities relative to historical fixed income allocations. The paper defines risky assets as investments in public equity, alternative assets, and high-yield bonds. 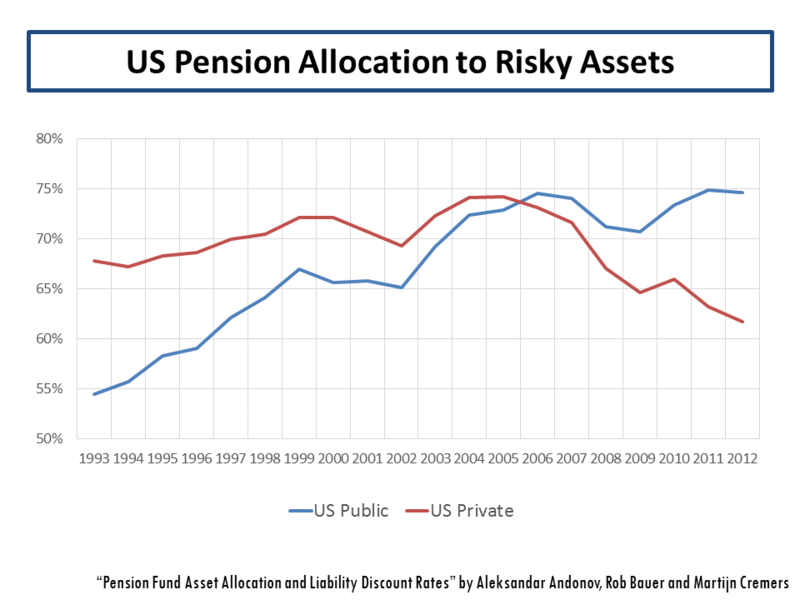 The authors state that “a 10% increase in the percentage of retired members of U.S. public pension funds is associated with a 5.93% increase in their allocation to risky assets” and for all other funds “a 10% increase in the percentage of retired members is associated with a 1.67% lower allocation to risky assets”. The graph below shows public pension higher allocation to risky assets up to 2012. It would be fascinating to see if this trend has continued to today. They further conclude that “this increased risk-taking enables more mature U.S. public funds to use higher discount rates, as a 10% increase in their percentage of retired members is associated with a 75 basis point increase in their discount rate” and that “our regulatory incentives hypothesis argues that the GASB guidelines give U.S. public funds an incentive to increase their allocation to risky assets with higher expected returns in order to justify a higher discount rate and report a lower value of liabilities”. The graph below illustrates the stark difference between the US and Europe. So, in conclusion, unless Mr Trump does something really stupid (currently around 50:50 in my opinion) like start a war, current valuations can be justified within a +/- 10% range by bulls assuming the possibility of fiscal stimulus and/or tax cuts is still on the table. However, there are cracks in the system and as interest rates start to increase over the medium term, I suspect vulnerabilities will be exposed in the current bull argument. I am happy to take some profits here and have reduced by equity exposure to around 35% of my portfolio to see how things go over the summer (sell in May and go away if you like). The ability of Trump to deliver tax cuts and/or fiscal stimulus has to be question given his erratic behaviour. Anecdotally my impression is that aging investors are more exposed to equities than historically or than prudent risk management would dictate, even in this interest rate environment, and this is a contributing factor behind current sunny valuations. Any serious or sudden wobble in equity markets may be magnified by a stampede of such investors trying to protect their savings and the mammoth gains of the 8 year old bull market. For the moment through, to misquote Chuck Price, as long as the music is playing investors are still dancing. Many things will be written about the events of 2016. The populist victories in the US election and the UK Brexit vote will no doubt have some of the biggest impacts amongst the developed world. Dissatisfaction amongst the middle class across the developed world at their declining fortunes and prospects, aligned with the usual disparate minorities of malcontent, has forced a radical shift in support away from the perceived wisdom of the elite on issues such as globalisation. The strength of the political and institutional systems in the US and the UK will surely adapt to the 2016 rebuff over time. The more fundamental worry for 2017 is that the European institutions are not strong enough to withstand any populist curveball, particularly the Euro. With 2017 European elections due in France, Germany, Netherlands and maybe in Italy, the possibility of further populist upset remains, albeit unlikely (isn’t that what we said about Trump or Brexit 12 months ago!). The 5% rise in the S&P 500 since Trump’s election, accounting for approx half of the overall increase in 2016, has made the market even more expensive with the S&P 500 currently over 60% of its historical average based upon the 12 month trailing PE and the Shiller CAPE (cyclically adjusted price to earnings ratio, also referred to as the PE10). A recent paper by Valentin Dimitrov and Prem C. Jain argues that stocks outperform 10-year U.S. Treasuries regardless of CAPE except when CAPE is very high (the current CAPE is just above the “very high” reference point of 27.6 in the paper) and that a high CAPE is an indicator of future stock market volatility. Bears argue that the President elect’s tax and expansionary fiscal policies will likely lead to higher interest rates and inflation in 2017 which will further strengthen the dollar, both of which will pressure corporate earnings. 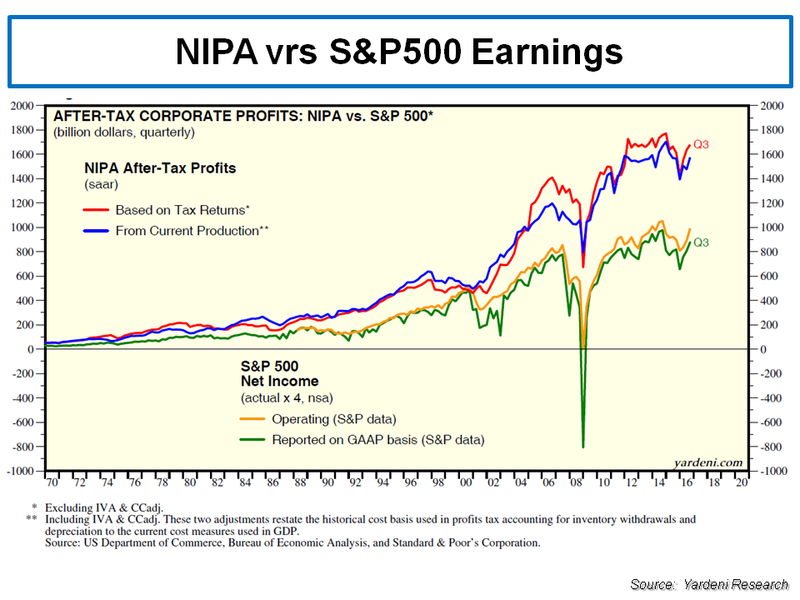 Critics of historical PE measures like CAPE, such as Jeremy Siegel in this paper (previous posts on this topic are here and here), highlight the failings of using GAAP earnings and point to alternative metrics such as NIPA (national income and product account) after-tax corporate profits which indicate current valuations are more reasonable, albeit still elevated above the long term average by 20%-30%. The graph below from a Yardeni report illustrates the difference in the earnings metrics. Bulls further point to strong earnings growth in 2017 complemented by economic stimulus and corporate tax giveaways under President Trump. 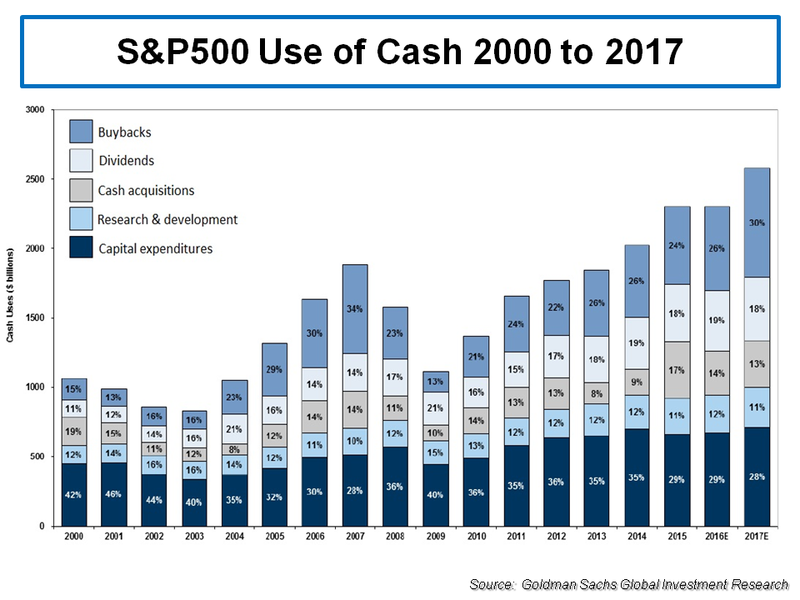 Goldman Sachs expects corporations to repatriate approx $200 billion of overseas cash and to spend a lot of it buying back stock rather than making capital expenditures (see graph below) although the political pressure to invest in the US may impact the balance. The consensus amongst analysts predict EPS growth in 2017 in the high single digits, with many highlighting further upside depending upon the extent of the corporate tax cuts that Trump can get past the Republican congress. 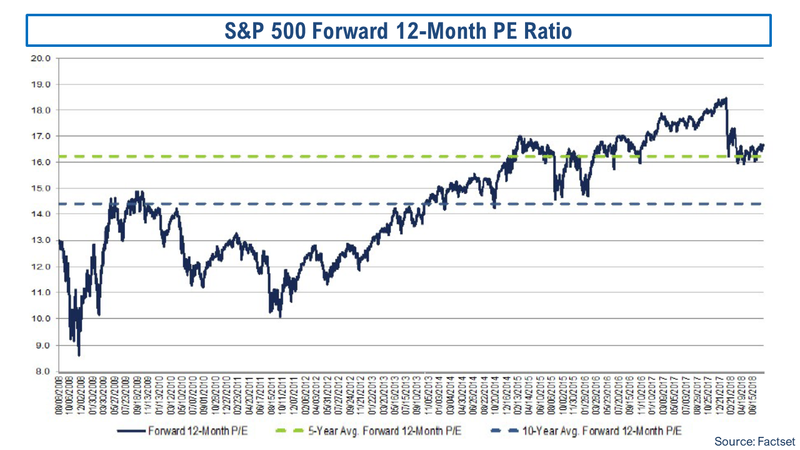 Bulls argue that the resulting forward PE ratio for the S&P 500 of approx 17 only represents a 20% premium to the longer term average. 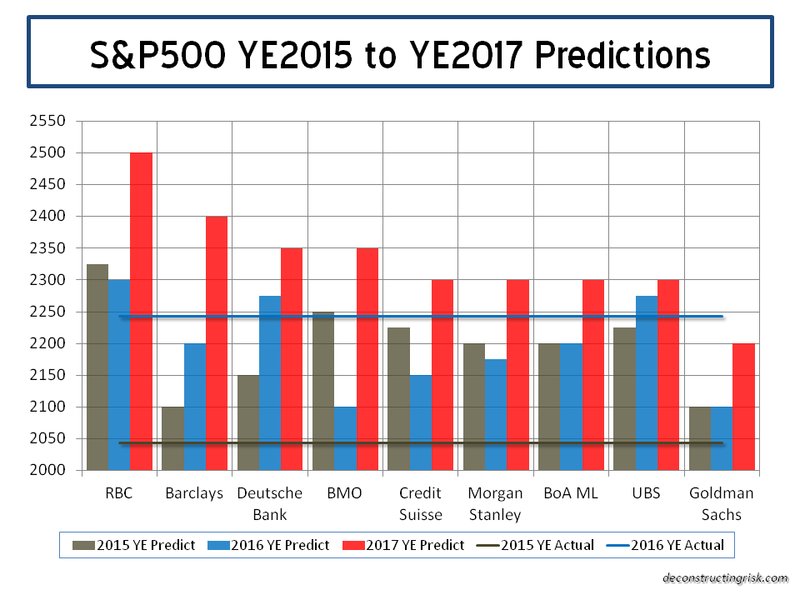 Predictions for the S&P 500 for 2017 by a selection of analysts can be seen below (the prize for best 2016 prediction goes to Deutsche Bank and UBS). It is interesting that the average prediction is for a 4% rise in the S&P500 by YE 2017, hardly a stellar year given their EPS growth projections! My best guess is that the market optimism resulting from Trump’s victory continues into 2017 until such time as the realities of governing and the limitations of Trump’s brusque approach becomes apparent. Volatility is likely to be ever present and actual earnings growth will be key to the market story in 2017 and maintaining high valuation multiples. 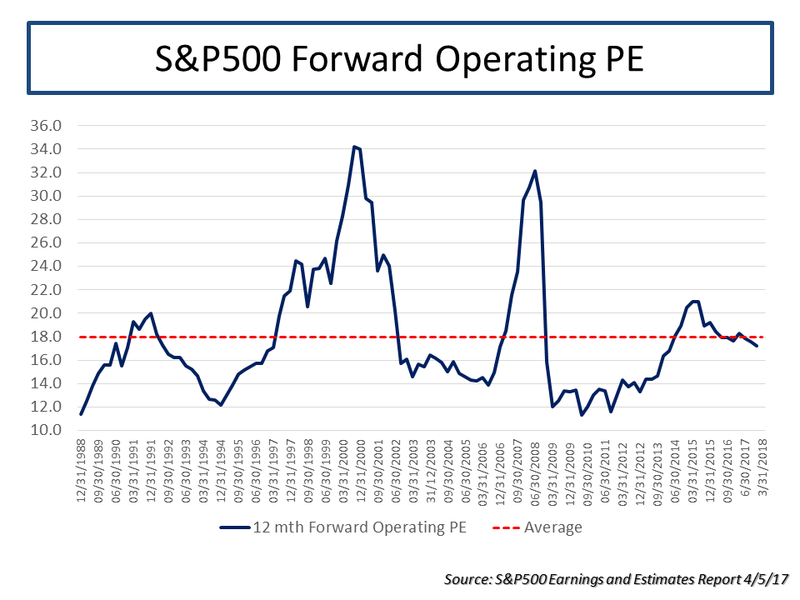 After all, a low or high PE ratio doesn’t mean much if the earnings outlook weakens; they simply indicate how far the market could fall! Absent any significant event in the early days of Trump’s presidency (eh, hello, Mr Trump’s skeleton cupboard), the investing adage about going away in May sounds like a potentially pertinent one today. Initial indications of Trump’s reign, based upon his cabinet selections, indicate sensible enough domestic economy policies (relatively) compared with an erratic foreign policy agenda. I suspect Trump first big foreign climb down will come at the hands of the Chinese, although his bromance with Putin also looks doomed to failure. How Brexit develops in 2017 looks to be much more worrying prospect. After watching her actions carefully, I am fast coming to the conclusion that Theresa May is clueless about how to minimise the financial damage from Brexit. Article 50 will be triggered in early 2017 and a hard Brexit now seems inevitable, absent a political shock in Europe which results in an existential threat to the EU and/or the Euro. The economic realities of Brexit will only become apparent to the UK and its people, in my view, after Article 50 is triggered and chunks of industry begin the slow process of moving substantial parts of their operation to the continent. This post illustrates the point in relation to London’s insurance market. The sugar high provided by the sterling devaluation after Brexit is fading and the real challenge of extracting the UK from the institutions of the EU are becoming ever apparent. Prime Minister May should be leading her people by arguing for the need for a sensible transition period to ensure a Brexit logistical tangle resulting in unnecessary economic damage is avoided. Instead, she acts like a rabbit stuck in the headlights. Political turmoil seems inevitable as the year develops given the current state of the UK’s fractured political system and lack of sensible leadership. The failure of a coherent pro-Europe political alternative to emerge in the UK following the Brexit vote, as speculated upon in this post, is increasingly looking like a tragedy for the UK. Of course, Trump and Brexit are not the only issues facing the world in 2017. China, the Middle East, Russia, climate change, terrorism and cyber risks are just but a few of the issues that seem ever present in any end of year review and all will likely be listed as such in 12 months time. For me, further instability in Europe in 2017 is the most frightening potential addition to the list. As one ages, it becoming increasingly understandable why people think their generation has the best icons. That said, the loss of genuine icons like Muhammad Ali and David Bowie (eh, sorry George Michael fans) does put the reality of the ageing (as highlighted in posts here and here) of the baby boomer generation in focus. On a personal note, 2016 will always be remembered by me for the loss of an icon in my life and emphasizes the need to appreciate the present including all of those we love. So on that note, I’d like to wish all of my readers a prosperous, happy and healthy 2017. It looks like there will be plenty to write about in 2017…..
How low is CAT pricing? So, the February dip in the equity market is but a memory with the S&P500 now in positive territory for the year. With the forward PE at 16.4 and the Shiller CAPE at 25.75, it looks like the lack of alternatives has, once again, brought investors back to the equity market. As Buttonwood puts it – “investors are reluctant bulls; there seems no alternative.” A December report from Bank of England staffers Rachel and Smith (as per previous post) has an excellent analysis of the secular drivers on the downward path of real interest rates. I reproduced a sample of some of the interesting graphs from the report below. In the course of a recent conversation with a friend on the lack of attractive investment opportunities the subject of insurance linked securities (ILS) arose. My friend was unfamiliar with the topic so I tried to give him the run down on the issues. I have posted my views on ILS many times previously (here, here and here are just a recent few). During our conversation, the question was asked how low is current pricing in the catastrophe market relative to the “technically correct” level. So this post is my attempt at answering that question. On a back of the envelop basis (I am sure professionals in this sector will be appalled at my crude methodology!). Market commentary currently asserts that non-US risks are the more under-priced of the peak catastrophe risks. Guy Carpenter’s recent rate on line (ROL) regional index, which is a commonly used industry metric for premium as a percentage of limit, shows that US, Asian, European and UK risks are off 30%, 28%, 32% and 35% respectively off their 2012 levels. Using the US as a proxy for the overall market, I superimposed the Guy Carpenter US ROL index over historical annual US insured losses (CPI inflation adjusted to 2015) as per Munich Re estimates in the graph below. 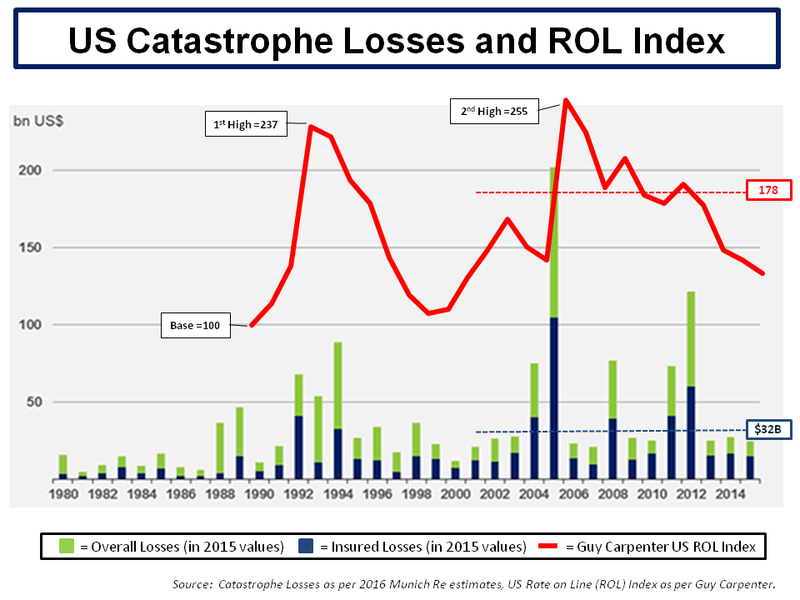 The average insured loss and ROL index since 1990 is $25 billion and 168 respectively. On the graph below I show the 15 year average for both which is $32 billion and 178 respectively. The current ROL pricing level is 18% and 23% below the average ROL since 1990 and the 15 year average respectively. However, inflation adjusted insured losses are not exposure adjusted. Exposure adjusted losses are losses today which take into account today’s building stock and topology. To further illustrate the point, the graph in this 2014 post from Karen Clark shows exposure adjusted historical catastrophe losses above $10 billion. One of the vendor catastrophe modelling firms, AIR Worldwide, publishes its exposure adjusted annual average insured loss each year and its 2015 estimate for the US was $47 billion (using its medium timescale forecasts). That estimate is obviously some way off the 15 year average of $32 billion (which has been influenced by the recent run of low losses). By way of answering the question posed, I have assumed (using nothing more than an educated guess) a base of an average annual insured loss level of $40 billion, being within an approximate inflation adjusted and exposure adjusted range of $35-45 billion, would imply a “technically correct” ROL level around 185. I guesstimated this level based upon the 10 year average settling at 195 for 4 years before the 2016 decline and applying a discount to 185 due to the lower cost of capital that ILS investors require. The former assumes that the market is an efficient means of price discovery for volatile risks and the latter is another way of saying that these ILS investors accept lower returns than professional insurers due to the magic which market wisdom bestows on the uncorrelated nature of catastrophic risk. 185 would put current US catastrophe premium at a 25% discount to the supposed “technical correct” level. 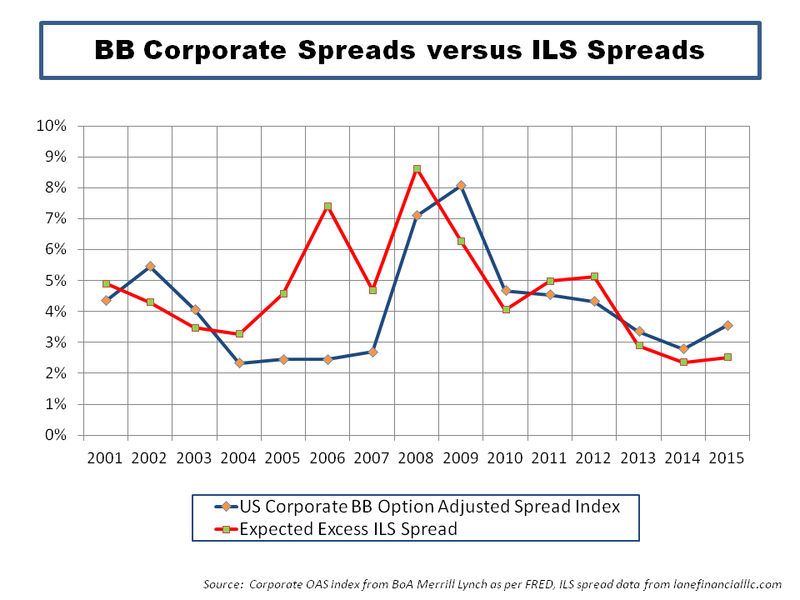 I cannot but help think that the capital markets are not fully appreciating the nuances of the underlying risks and simply treating catastrophe risks like other BB asset classes as the graph below illustrates. There is an alternate explanation. The factors impacting weather systems are incredibly complex. Sea surface temperatures (SSTs) and wind shear conditions are key variables in determining hurricane formation and characteristics. Elements which may come into play on these variables include the North Atlantic Oscillation (NAO) which is a fluctuation in pressure differences between the Icelandic and Azores regions, the Atlantic Multi-Decadal Oscillation (AMO) which measures the natural variability in sea surface temperature (and salinity) of the North Atlantic, and the El Niño Southern Oscillation (ENSO) which measures cyclical temperature anomalies in the Pacific Ocean off South America. Climate change is impacting each of these variables and it may be possible that US hurricanes will become less frequent (but likely more severe). 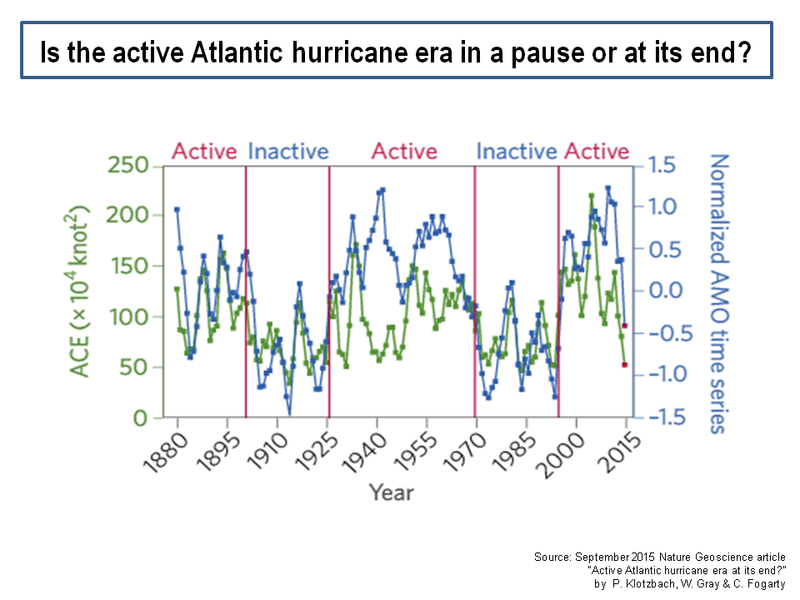 An article from late last year in the Nature Geoscience Journal from Klotzbach, Gray and Fogarty called “Active Atlantic hurricane era at its end?” suggests the active hurricane phase in the Atlantic could be entering a new quieter cycle of storm activity. The graph below is from their analysis. Could it be that the capital markets are so efficient that they have already factored in such theories with a 25% discount on risk premia? Yep, right.